These potholes along our journey can sometimes threaten to engulf the peace we have created with fear and uncertainty. Even the good things can cause an unexpected disruption; finding out you are finally pregnant, a dream job in a new state, a lottery win, a marriage, a new home. The list is endless. 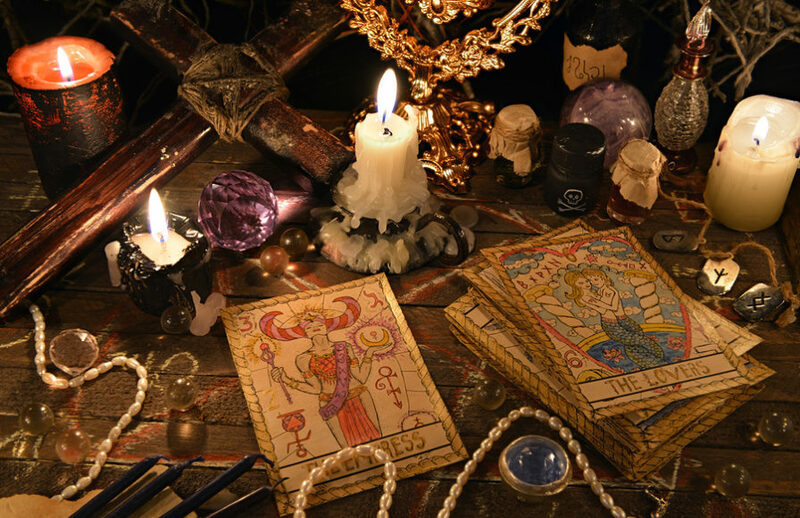 When these crossroads find us, and they will, Tarot will offer the guidance to navigate the road ahead with valuable insights to help make decisions in a natural and relaxed manner, in a healthy and positive way. Tarot helps us to identify the reasons for our feelings. Often we feel sad or upset about something that may or may not show itself clearly. On the surface level, we may believe we know the reason, but with Tarot, we are more able to dig out the root of these feelings once and for all. Tarot can also help us make potentially life-altering decisions in which the process can sometimes be very stressful. Tarot readings help ease some of this stress by guiding us to see all angles from many different perspectives. A single message from a Tarot reading may be all that is needed to make this decision in a more balanced and positive way. A Tarot reading is especially useful when we are stuck in a situation that no longer serves our highest and best good. This could be a job, a relationship, our environment, our health, or life in general where we no longer feel in the flow of life. Tarot is also an incredibly useful tool to help us understand the people we surround ourselves with and those who appear in our lives by chance or circumstances. Tarot can offer us advice on how best to vibrate with these people or help us determine whether we need to vibe somewhere else. Tarot helps us talk to our loved ones on the other side. We can ask them questions and receive answers through the cards using certain spreads or just a few cards. Tarot can also help us by merely pulling a card in the morning to start our day. This daily practice offers us quiet time in the morning to center and ground ourselves, think of the day ahead while creating a blueprint of the path in which we aspire the day to be. This simple act of pulling a Tarot card each day will set us up for success by helping our intuition work as a tool to nudge our mind in the right direction. Tarot gives us a starting point, a message, that can take us in whatever direction we feel called by the card. By listening to and trusting the first thought that pops into our head when seeing the card, it expands and strengthens our intuitive muscle while offering us a message that is more than likely what we need to hear at the moment. By strengthening our intuitive muscle daily, we will start seeing other fantastic benefits, like better decision making, clearer thinking, internal dialogue and trust rather than the external need for validation, as well as knowing we are more than capable of making our lives more enjoyable by empowering ourselves with clear purpose and intention. As you can see, Tarot can be the exact tool we need to ensure the proper conditions are met to help the seeds we plant in our garden grow strong, vivid, healthy, beautiful, vibrant and nourishing with minimal weeding. Find Answers To Life’s Persistent Questions With An Accurate Tarot, Psychic & Astro Reading From One Of Our Honest, Accurate Advisors. Download our App today and get a Free Question.